Warning: cuts may be deeper than they appear. 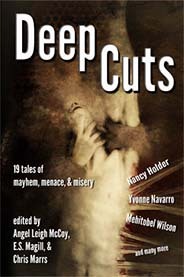 19 short horror stories to give you shivers plus 60 recommendations for powerhouse tales written by women—those bloody stylings and chainsaw rhythms that have lain hidden like deadly gems among other great works. “Deep Cuts smartly sidesteps the bloody ‘women in horror’ debate and puts its money where its mouth is. This fantastic collection, featuring both genders, pays tribute to the best dark tales told by women. A deeply cerebral experience that is at times honest and intimate, but always chilling.” —Mercedes M. Yardley, author of Beautiful Sorrows Cover art by Anja Millen. Contributors include Nancy Holder, Yvonne Navarro, Mehitobel Wilson, Lisa Morton, Sandra Odell, Samael Gyre, Sara Taylor, Michael Haynes, R.S. Belcher, Stephen Woodworth, C.W. Smith, Colleen Anderson, James Chambers, Ed Kurtz, Rachel Karyo, Kelly A. Harmon, Scathe meic Beorh, Patricia Lillie, Satyros Phil Brucato, and Rob M. Miller.